Renhold United remain seven points clear at the head of the Premier Division supported by Sportsform despite losing their 100% away record when held to a 2-2 draw at Wootton Blue Cross. Phil Matthews was on the home scoresheet twice against United replies from Aaron Hazelwood and Tommy Foyle. Now up into second spot are Flitwick Town who ran out 2-0 away winners at Eastcotts AFC thanks to strikes from Alex Robinson-Welsh and Ritchie Bevan. This saw them climb above Shefford Town & Campton in the standings who were held to a 1-1 draw at Marston Shelton Rovers, Sam Abbott netting for the Rovers and Jake Renney for the Town. Town’s assistant referee Graham Earl took over the whistle in the second half after match referee Kieran Dunne suffered a back spasm during the half-time break. Elsewhere it was a red letter day for Sandy who netted their first home win of the season in defeating AFC Oakley M&DH 3-2. Tom McGhee, Phil Beall and Chris Gregory were on their scoresheet against replies via Alex Liburd and Matt Barnes. It was also a red letter day for Caldecote who recorded their first away win of the season in winning 3-0 at Ickwell & Old Warden. Ahead after just two minutes with a goal from Connor Smith the tally was added to in the second half by both Jordan Goodman and Carl Heath. Also enjoying life on the road were Pavenham who won 3-2 at Sharnbrook thanks to goals from Luke Owen, James Owen and Patrick Geovenni against home strikes from Shaun Barnett and Harry Atherton. Whilst for AFC Kempston Town & Bedford College it was a 3-0 home win over Wilstead. Josh Sturniolo, Ryan Smith and Andrew Latimer netting the goals to do the damage. Cranfield United are now within three points of league leaders Elstow Abbey after they came from two goals down at half-time to net a 4-2 home victory over them at Crawley Road. Dom Parrella scored for the Abbey after just 50 seconds and Cullam Davenport doubling the scoreline on 24 minutes before United’s Jordan Appleton took over in the second period to net all four of his sides goals. Abbey ended the game with 10 men after Davenport was given a second yellow card just 10 minutes from time by which stage United had moved into a 3-2 lead. For third place Henlow it was a 6-0 away win at second from bottom of the table AFC Harlington. 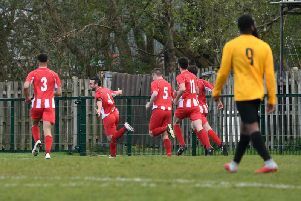 Phil Robberton with a brace was joined on the scoresheet by Matt Wilson, Keith Milburn, Jake Berry and James Campbell. Whilst for fourth place Great Barford it was an end to their 13 game unbeaten league run when defeated 1-0 at home by Queens Park Crescents whose goal came via Daniel Rasol. Now up into fifth are Riseley Sports who emerged 5-4 winners at AFC Kempston Town & Bedford College Reserves. Mark Darlow with a hat-trick and James Cook with a brace bringing up the nap hand against Town braces in reply from Ashley Windridge and Keegan Roberts. Elsewhere, AFC Oakley M&DH Reserves’ winless run is now up to eight games after they were held 3-3 at home by bottom of the table Marabese Ceramics. Jamie Endersby, John Hislop and Jason Angol were on the home scoresheet against Tilermen replies via John Vooght twice and Michael Darnell. Whilst Bedford SA winless ways are up to seven games after they were beaten 2-1 at Sundon Park Rangers. Matthew Conway with a brace seeing his goals only replied to once by Tom Marwood. Meantime, Potton Town are now without a win in their last six outings after being held to a 0-0 home draw by Shefford Town & Campton Reserves. We now have new leaders at the head of the division two league table in the shape of Stevington after they took their winning league ways up to 14 games and remained unbeaten on home soil this season with a 3-1 victory over Kempston Athletic. An own goal plus a brace from Aaron Hewitt was only responded to once by Billy Mills for the Athletic. Saying goodbye to the top spot are Clapham Sports who were held to a 2-2 draw at Kempston Hammers, Nathan Evans plus a Jamie Peacock penalty marking the Hammers scoresheet against a brace in reply from Liam Bolton. Elsewhere it was home wins for both Moggerhanger United and Wootton Village. United seeing off Marston Shelton Rovers Reserves 2-0 thanks to a brace of goals from Lee Adams and the Village going one better with a 3-0 win over Bedford United. Adam Flynn netting twice and Aaron Williams once to do the damage. Westoning will now travel to Kempston Hammers in round two after they ran out 7-0 away winners at Meltis Albion Reserves, Shaun Cooksley with a hat-trick joined on the scoresheet by Glenn Cooksley, Tom Cooksley, Cody O’Neil and Sam Roberts. For Wilstead Reserves it was an 8-4 home win over Caldecote Reserves. Callum Evans netting four times, Robert Booth twice to go with single strikes from Sam Smith and Ryan Davenport against visiting replies from Alan Turner twice plus single goals for Hugh Jackson and Jamie Saunderson. They will now face a home second round tie against Elstow Abbey Reserves who ran out 2-0 winners at Renhold United Reserves where Jhey Tompkins netted both goals. There is no change at the head of the division three league table following wins for the top three sides. League leaders Flitwick Town Reserves chalked up their eighth home win on the bounce to retain their unbeaten home ways thanks to a single strike from Benn Ward which took them to a 1-0 win over bottom of the table Mid Beds Tigers. Whilst second place Lea Sports PSG ran out 5-0 home winners over Clifton who have now lost all of their last eight away outings.Owen Malcolm netting alongside an own goal plus strikes from Sean Dixon, Joseph Hennem and Ryan Darby. For third place Cranfield United Reserves it was a 2-1 victory at Shefford Town & Campton Reserves. Daniel Mclaren and Adam Kerr on the scoresheet against a lone home reply via Scott Frucciante. Also winning on the road were White Eagles who emerged 2-1 winners at FC Serbia. Kazimierz Drzechowski and Mateusz Dybikowski on the Eagles scoresheet against a lone home reply via Zdenko Kuhar. Over at Harvey Close, Caldecote U20 ended a run of 11 league games without a win by defeating Dinamo Flitwick 2-1.Jamie Richardson and James Whitmore netting the vital goals against a lone reply from Mark Reynolds. Whilst Atletico Europa were gifted the three points after Westoning U20 failed to raise a side to meet them at Greenfield Road.